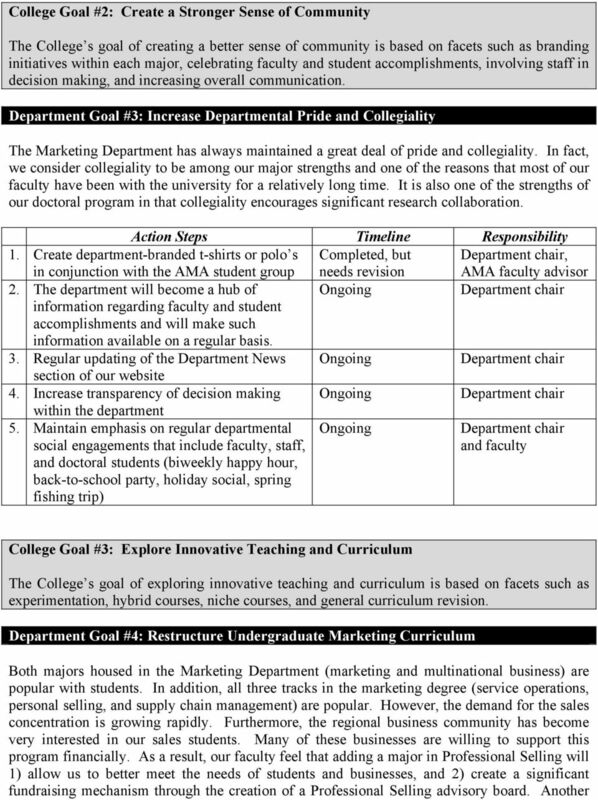 Download "Department of Marketing College of Business Florida State University. 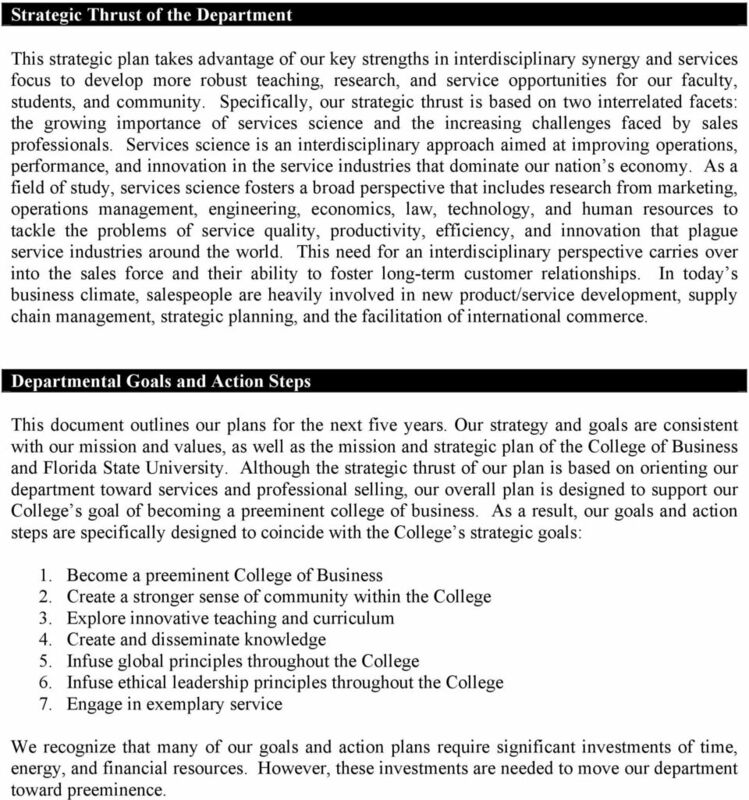 2007 2011 Strategic Plan"
1 Department of Marketing College of Business Florida State University Strategic Plan Updated Version Adopted December 10, 2007 International Acclaim. Individual Attention. 2 Department of Marketing Strategic Plan Mission Statement Our mission is to educate the next generation of marketing, sales, operations, supply chain, and multinational business professionals in an atmosphere that values innovation, excellence, and integrity. We recognize that this is a multifaceted effort consisting of quality scholarly research, innovative curriculum, and active participation in the broader community of our profession and society. 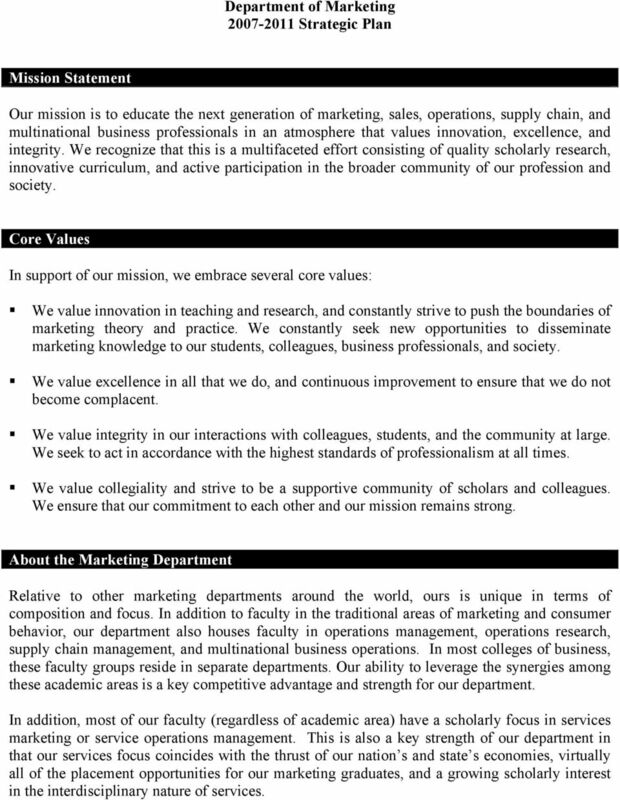 Core Values In support of our mission, we embrace several core values: We value innovation in teaching and research, and constantly strive to push the boundaries of marketing theory and practice. We constantly seek new opportunities to disseminate marketing knowledge to our students, colleagues, business professionals, and society. We value excellence in all that we do, and continuous improvement to ensure that we do not become complacent. We value integrity in our interactions with colleagues, students, and the community at large. We seek to act in accordance with the highest standards of professionalism at all times. We value collegiality and strive to be a supportive community of scholars and colleagues. We ensure that our commitment to each other and our mission remains strong. About the Marketing Department Relative to other marketing departments around the world, ours is unique in terms of composition and focus. In addition to faculty in the traditional areas of marketing and consumer behavior, our department also houses faculty in operations management, operations research, supply chain management, and multinational business operations. In most colleges of business, these faculty groups reside in separate departments. Our ability to leverage the synergies among these academic areas is a key competitive advantage and strength for our department. In addition, most of our faculty (regardless of academic area) have a scholarly focus in services marketing or service operations management. This is also a key strength of our department in that our services focus coincides with the thrust of our nation s and state s economies, virtually all of the placement opportunities for our marketing graduates, and a growing scholarly interest in the interdisciplinary nature of services. 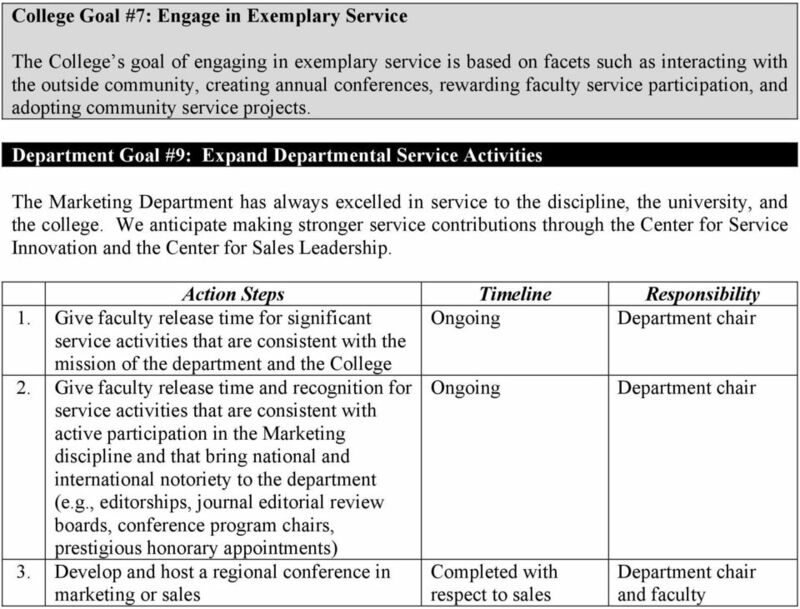 3 Strategic Thrust of the Department This strategic plan takes advantage of our key strengths in interdisciplinary synergy and services focus to develop more robust teaching, research, and service opportunities for our faculty, students, and community. Specifically, our strategic thrust is based on two interrelated facets: the growing importance of services science and the increasing challenges faced by sales professionals. Services science is an interdisciplinary approach aimed at improving operations, performance, and innovation in the service industries that dominate our nation s economy. As a field of study, services science fosters a broad perspective that includes research from marketing, operations management, engineering, economics, law, technology, and human resources to tackle the problems of service quality, productivity, efficiency, and innovation that plague service industries around the world. This need for an interdisciplinary perspective carries over into the sales force and their ability to foster long-term customer relationships. In today s business climate, salespeople are heavily involved in new product/service development, supply chain management, strategic planning, and the facilitation of international commerce. Departmental Goals and Action Steps This document outlines our plans for the next five years. Our strategy and goals are consistent with our mission and values, as well as the mission and strategic plan of the College of Business and Florida State University. 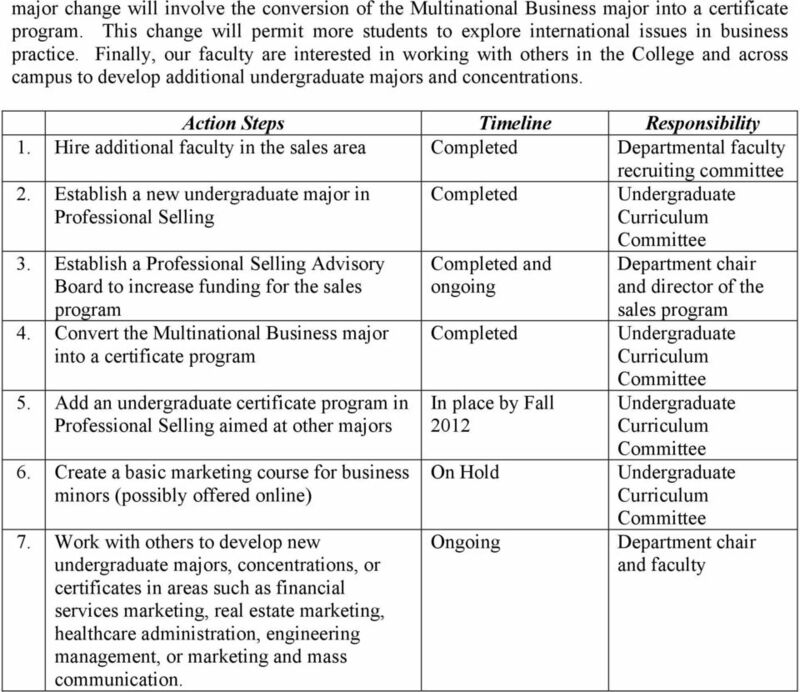 Although the strategic thrust of our plan is based on orienting our department toward services and professional selling, our overall plan is designed to support our College s goal of becoming a preeminent college of business. 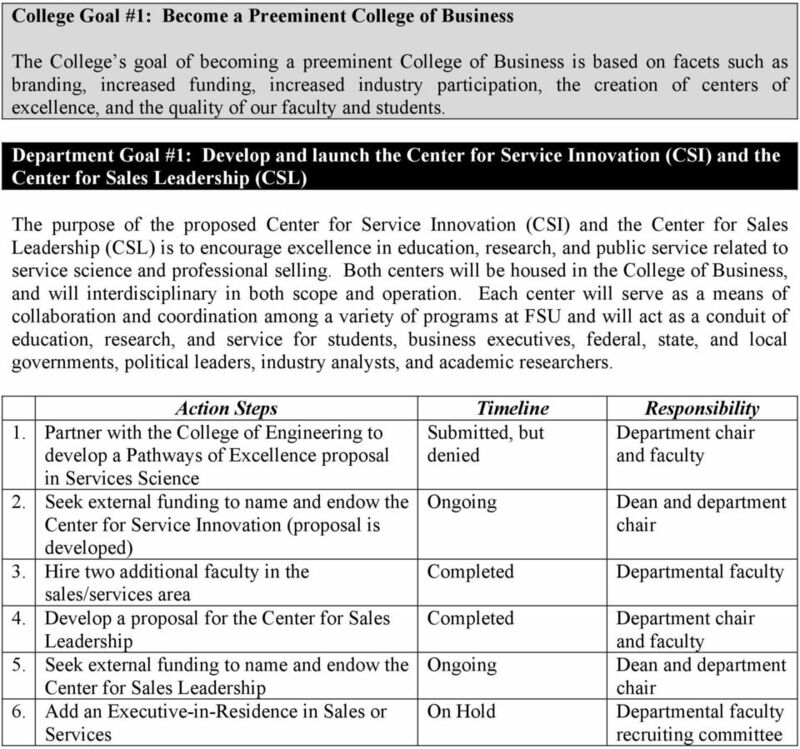 As a result, our goals and action steps are specifically designed to coincide with the College s strategic goals: 1. Become a preeminent College of Business 2. Create a stronger sense of community within the College 3. Explore innovative teaching and curriculum 4. Create and disseminate knowledge 5. 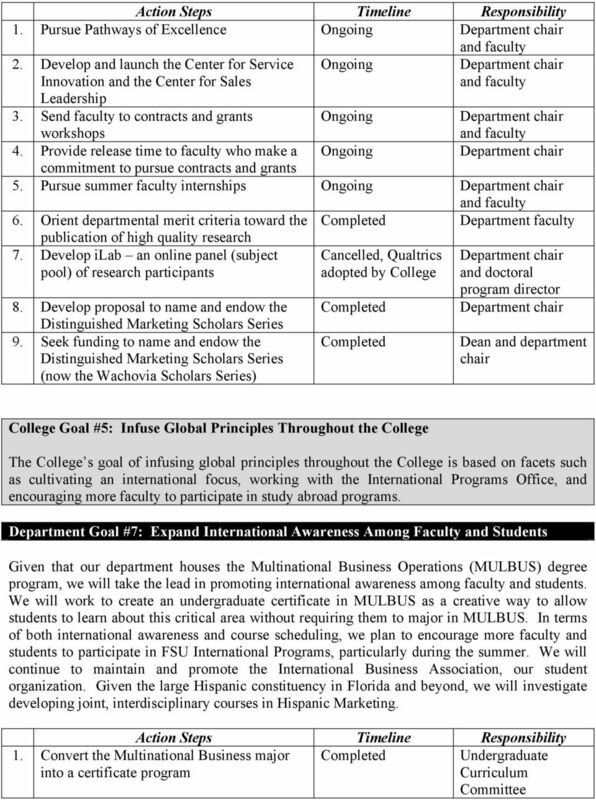 Infuse global principles throughout the College 6. 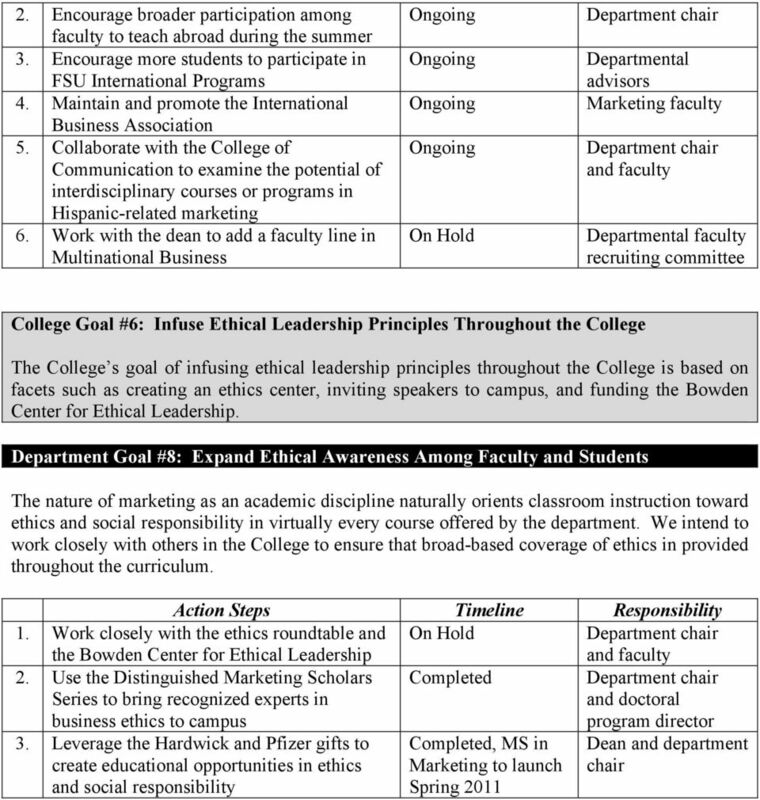 Infuse ethical leadership principles throughout the College 7. Engage in exemplary service We recognize that many of our goals and action plans require significant investments of time, energy, and financial resources. However, these investments are needed to move our department toward preeminence. 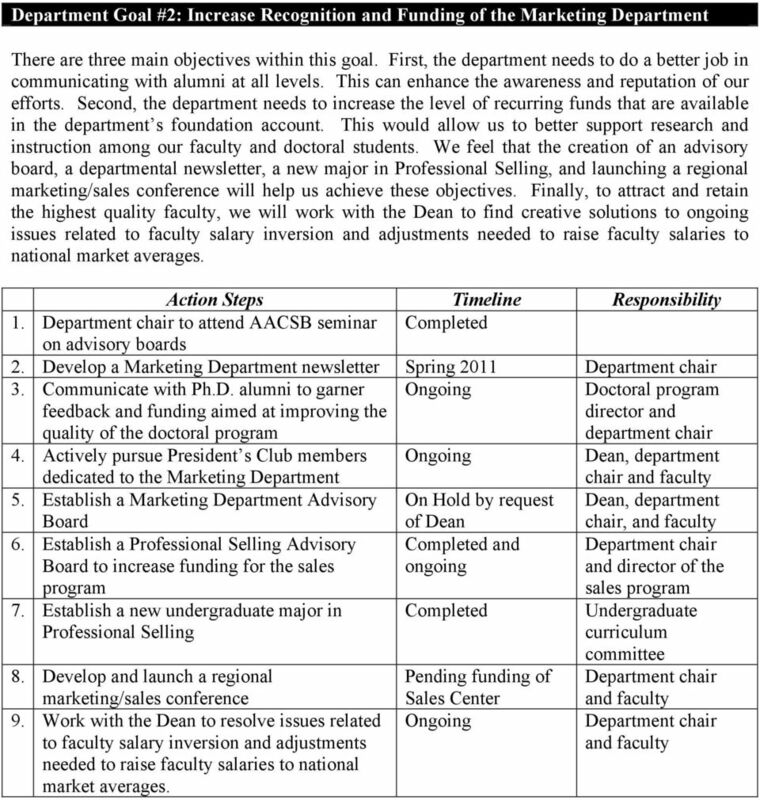 8 Department Goal #5: Restructure Graduate Marketing Curriculum One of the major resource constraints in our department is the fact that current MBA offerings are too closely tied to individual faculty. Hence, faculty turnover, sabbaticals, or professional leaves interrupt our ability to offer these courses on a consistent basis. By refocusing our MBA concentration, we can offer courses that can be taught by a wider range of faculty. Our faculty are also interested in working with others in the College or across campus to develop additional graduate programs. Cancelled by Master s Policy Master s Policy 1. Convert current 3-course (9 hour) MBA concentration into a 2-course (8 hour) concentration. Courses to be Supply Chain I and Supply Chain II. 2. Streamline all MBA elective course offerings across the full-time, part-time, and online programs. 3. Work with others to develop new graduate programs in areas such as healthcare administration, engineering management, joint degrees (MBA/MD, MBA/Nursing, MBA/Engineering, MBA/Mass Communication), and/or online professional certificates., but MS in Marketing to launch Spring 2011 Master s Policy College Goal #4: Create and disseminate knowledge The College s goal of creating and disseminating knowledge is based on facets such as increasing A quality research, developing new centers of excellence, participating in the Pathways of Excellence initiative, and increasing funded research. 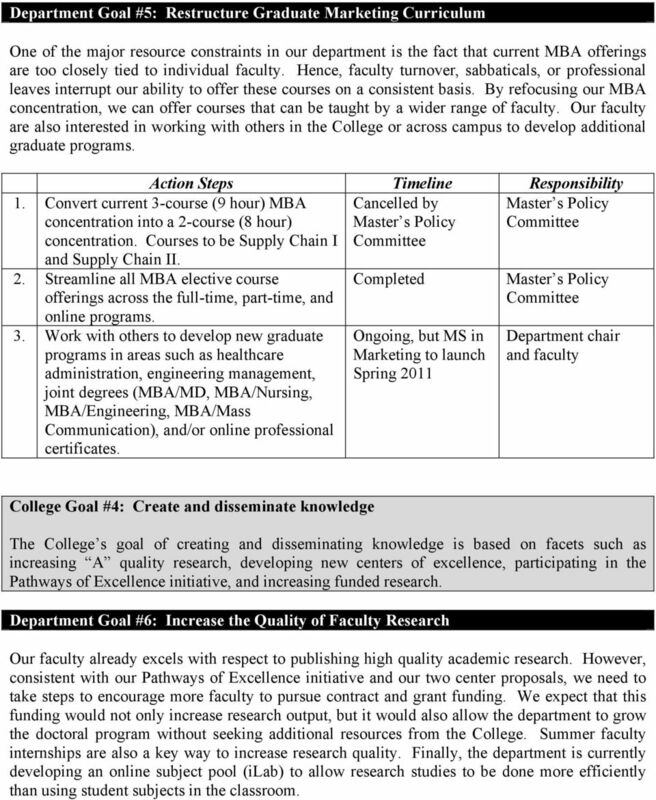 Department Goal #6: Increase the Quality of Faculty Research Our faculty already excels with respect to publishing high quality academic research. However, consistent with our Pathways of Excellence initiative and our two center proposals, we need to take steps to encourage more faculty to pursue contract and grant funding. We expect that this funding would not only increase research output, but it would also allow the department to grow the doctoral program without seeking additional resources from the College. Summer faculty internships are also a key way to increase research quality. Finally, the department is currently developing an online subject pool (ilab) to allow research studies to be done more efficiently than using student subjects in the classroom.